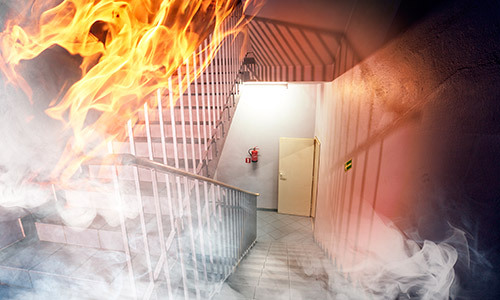 Fire protection is a complicated beast: no matter how many safety measures you put in place, or how often you inspect your premises for fire hazards, there’s still that chance that a spark could ignite and a flame erupt. When a fire hits your place of work, you may have no other choice than to escape the flames. This is why an evacuation plan is crucial to your continued safety, whether you’re at home or at work. Let’s break down the reasons why an evacuation plan in case of a fire is so important, and how you can take steps to making your own plan today. First, in order to understand why a fire emergency plan is so pivotal, it’s important to understand how the human brain reacts when it’s faced with an emergency. We’re taught to think that, should an emergency arise, we’d react like a hero in a movie – we’d be ready to act, thinking clearly and quickly when fueled by adrenaline. When a real emergency situation plays out, people are often surprised to discover that the “hero” representation just isn’t realistic – humans panic in the face of danger, and we don’t respond well or make quick decisions. Humans generally either “freeze” or “flee” instinctively in a fire emergency, without a single thought but that of safety… often making poor choices and becoming trapped in dangerous spots. Having a procedure ensures you’ll be able to act quickly on a well-thought-out plan. When a fire breaks out, you likely won’t be the only one present in the building. Many fatalities have occurred once a person has escaped from a burning building, and has decided to go back in to save someone. Some people have even rushed into burning buildings to save a loved one, a friend, or a co-worker, only to find out that they had already escaped. A fire plan allows you to discuss evacuation options with everyone who may be in the building at the time. Everyone should agree to a point where you will gather once you’ve escaped the building, so you can have a head count and ensure everyone made it out. Laying out an evacuation plan requires plotting out how someone would escape from a fire from any given room in a building, from server room to washrooms. While plotting out a path of escape, you might discover that a certain room or area of the building has no good escape routes, or would take too long to escape from. This allows you to open up discussion about how to solve the problem, and increase the amount of fire protection your building has. In the end, a fire evacuation plan is all about putting survival first. Many people have died because they were busy trying to save personal items from the fire, and were too busy to save themselves! An emergency fire plan puts things into perspective – items can be replaced, but your life can’t be. Toronto Fire Services in Numbers: Did you know? With over 30 years of experience in providing Toronto with fire protection and single source fire protection, our team of experienced professionals are able to provide the assistance you require to keep your facility running when you need it most. Steadfast Safety Services is the leader in Fire Safety Protection.